In case you haven't noticed, I've been on a budget lately. Or at least I have been limiting my clothing and accessories purchases *mostly* to thrifting and vintage, not only because I love doing it, but I'm trying to save a dime, you know? This ensemble is no exception and this dress is definitely one of my top finds so far this summer. Dress: Thrifted Spenser Jeremy 100% silk dress ~ $6! Long dresses/maxi dresses are in and IN and they aren't going away. I don't care if you are short, tall, fat, or ugly, you need to get over it and start wearing them because they can look good on everyone. I have been digging crazy prints lately, which is somewhat out of character, so when I was rifling through the racks at one of the more well kept thrift spots, my eyes darted to this dress. Once I touched the silk it was in my cart. It is so light it is perfect for the sweltering days we have been experiencing of late in Chicago. Plus the wrap panel that ties gives the dress some much needed shape. Shape is the key with most of these long numbers. Needless to say, I've been living in this dress this summer. The gold-toned print screams for gold accessories so I don't argue. 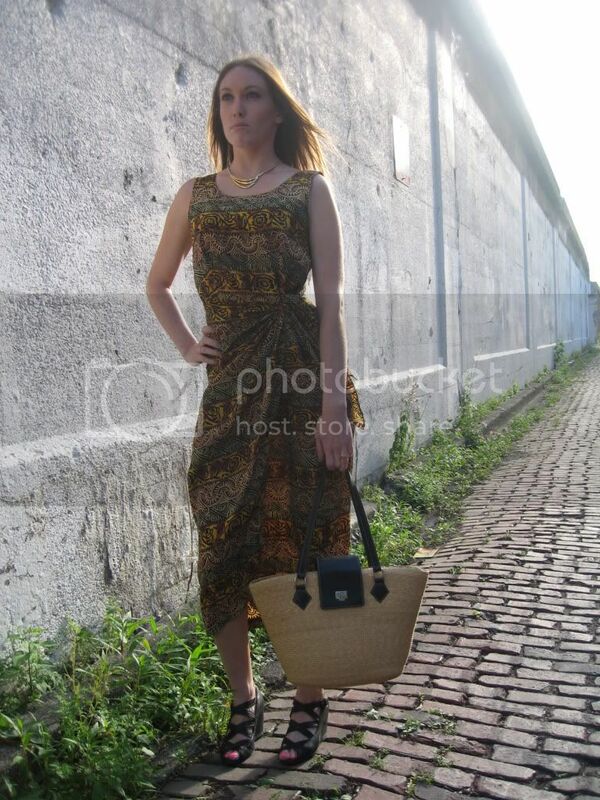 And the straw bag, also on trend, is a perfect complement. This ensemble is living proof that a.) you can wear silk for the same price as a beer or XL latte and b.) you can look "of the moment" through vintage and thrifting...if you're crafty about it. Thanks to one of my oldest and dearest friends for modeling. I skipped Bling of the Week this week and I am probably discontinuing the series. Thoughts??? There's obviously some bling in this post though.